Stampede 66 and Canyon Bar offers complimentary Valet and self-parking. Known as one of the founding fathers of Southwestern cuisine, celebrity Chef Stephan Pyles proudly features his unique cooking style at Stampede 66, our on-site steakhouse. Enjoy a modern twist on traditional Texas dishes and Southern home style fare. Our group thought the various food items we had were too spicy or had too many flavors going on in one dish. Two of us were surprised as this was our second time there and we again. Ordered the side of "pickles" on the menu as we liked them before. This time the "pickles" came out and were two hidden bread pickles at the bottom of the jar with jalapeños and pickled okra stuffed on top. These were extremely spicy! This ruined the entire meal for one person as it upset her stomach and she couldn't get the "fire" or taste out of her mouth to enjoy her chicken. Most of our party agreed they would not return. There is a good range of spiciness in the entrees. The waiter knows how to advise you on this point. I was very satisfied with his suggestion. Depends whether I would recommend to a friend. Based upon their food palate. 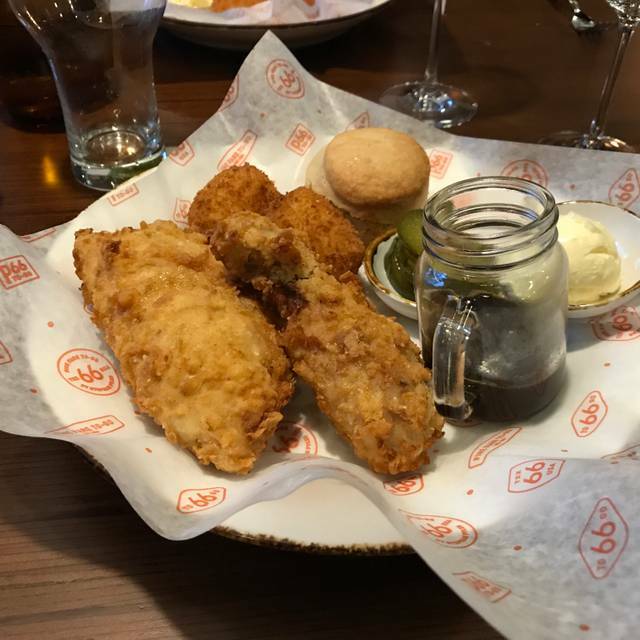 If you love the Stephan Pyles taste, you will thoroughly enjoy Stampede 66 for the food - not the service and possibly location. Bay of Fundy Salmon was seasoned exactly as I expected and was very well prepared and served as was my companions chicken fried buffalo. Drinks were lackluster and not a varied selection of innovative bar drinks. Wine by the glass was a nice selection. Did not care for the huge screen above my head that continued to flash light high and low. It is still a hotel venue for better or worse. I will eat there again because of the convenience and food, but hoping service improves. The food was great, the service was good. I really like the ambiance, and sure hope more people start going to bring a little more noise and fun. Food was tasty and good service but decor is very bland and basic. We preferred the former decor from the Dallas location. Overall, we enjoyed our dinner and will return. We arrived 1 minute before our reservation, and were seated almost immediately. The kitchen was backed up a bit, but we ordered appetizers which came out quickly, so we weren't too hungry waiting for our main course. Staff was friendly and courteous, and the food was excellent, well worth the wait! This was our first time and we really enjoyed it. Very nice atmosphere. The menu was good, all of us were able to find multiple things we would like. The brisket was excellent! Our waiter was outstanding; however, he was covering too many tables so we had to wait on some things. Small issue, I'm sure it will get worked out. Definitely will be back. Had a 6:30 reservation and seated promptly. Ordered drinks, then dinner with a shared appetizer to start. LONG wait for dinner to arrive. When it did, it was delicious but two of the meals came out together while the third was a couple minutes later. That is very annoying. Service was great, it was not her fault that the kitchen was slow. Liked the atmosphere, one of our party didn’t care for the enormous video screen in the dining room, said it puts off a terrible glare anytime he looked in that direction. Unfortunately his seat faced the screen almost dead on. We would give it another try because of the quality of the food and variety of the menu. Limited menu, burger average, sprouts tough, caesars salad was vertical wrapped in cheese with shrimp size of thimble, service was ok but waiter never refreshed water and did not know menu well. Would not return. We ate at Stampeed 66 recently with another couple. We shared the deviled eggs and the brussel sprouts. They were both very good. My companions were happy with their chicken fried buffalo and beef filet. I had the sea bass which was delicious. The veg it sat on was not as wonderful. Not bad; but, not great. My only complaint is that the west sun was right in my face even though I wasn’t near the window and there was some sort of louver deal between me and the window. Luckily the sun’s position shifted relatively quickly. Great new restaurant in Allen from master chef Stephen Pyles. The Chicken Fried Steak with chorizo gravy was outstanding. My wife also raved about the Stampede burger. Our son had the honey chicken and barely said a word while eating it, so we know he enjoyed it! Drinks were pricey ($14 each for simple vodka/rocks) and parking was also expensive ($4 x2 cars) but overall really nice new spot with excellent food. Maybe they should reconsider charging customers to park? This ain’t LA or New York and the giant parking garage was empty. This restaurant is soooo good!! The service was excellent . The cocktails were the best ever . We have already made another reservation in two weeks ! My two favorites were the margarita and the pork rinds with cheese foam appetizer! Food was delicious! Services was great! Will go back here for sure. Our first visit to this location and we were pleased with our experience. We had lunch and thought the menu was a bit more limited than we expected from our memories of the downtown location. Not really West Texas at lunch. 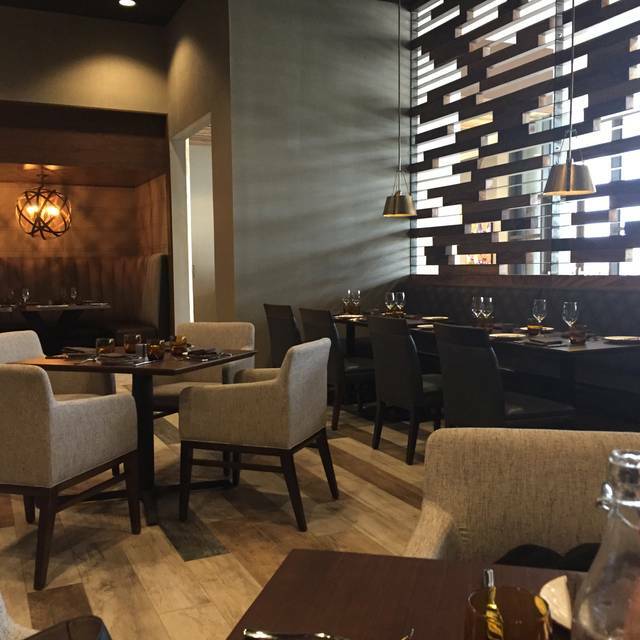 The restaurant, located in the new Delta Hotel in Allen, has a nice look to it and service was fine. Staff was welcoming and friendly. This was the 2nd day after their grand opening and we have no complaints. Look forward to returning for dinner and some West Texas fare. I wanted to try Stephan Pyles' new restaurant because I love Flora Street Cafe. It is quite a journey to get to Allen, TX. It is pretty much a hotel restaurant. I think I will stick with Flora Street Cafe. Love the place. Recommending to all my friends. Southwestern Caesar salad delicious and a unique presentation. Sandwiches all great,, especially barbecue brisket and honey -fried chicken ones. We had a lovely night! We like to visit many restaurants per month and we were wanting to drive to Allen and try Stampede and it was worth it. We were sat next to a big party and we could felt the energy of the place. I had the honey fried chicken and it was amazing. Having your valet ticket validated is a great idea! We visit Canyon bar after dinner, it is a beautiful bar, we also checked out the pool. Overall it was a great night out with my love. The main course was excellent both in quality and quantity. Desert, we shared the Pecan pie was mediocre at best. Very disappointing both in freshness, quality, and quantity. A very small tart served in a tiny black skillet. You would thing if they are serving a small pie/tart in a skillet it would be hot...or at least warm. Not the case, it was cold. The piece dough was old tasting and just not good. Overall, the experience was nice, and different in a good way. We were greeted with smiles and staff, service and food were top notch. Food was great but service was strange- very inexperienced waiter. I wish the ambience was less “hotel restaurant” like. We had a wonderful dinner at Stampede 66. Michelle, our waitress was truly amazing and so much fun. The Southwestern Caesar was to die for. We highly recommend the tenderloin for dinner...it was truly to die for. Desserts and specialty drinks were amazing and a can’t miss. We are looking forward to our next dinner here! I enjoyed the new hotel, it is very elegant, I noticed there was some kind of event going on at the hotel because there were kids all over. Once we got seated at the restaurant we were approached immediately by our server, we got served water and we were offered drinks. We enjoyed our food and the service, we noticed the restaurant had 2 rooms, I liked the one we were seated in. I will definitely come back! I LOVE this restaurant and so glad Stephen Pyles has chosen Allen for Stampede 66. Have missed him since Star Canyon days, but will return often to Stampede 66. I went to visit the new Stephen Pyles restaurant and over all it was a good night. The food was not as the previous Stampede in Dallas though. My server came to check on my table several times which I liked, I felt I was taken care of. I liked the country music and the overall decor! Lots of kids going around as well. Enjoyable dinner. Very good service and wine. Food was good but not over the top. OMG 3 1/2 hours for dinner! not that busy but kitchen was very slow, app took 35 minutes to be served then another 30 minutes for salads then 40 minutes for the entree dessert only 20 minutes after plates removed from entree. babysitter $100 i would only recommened to a friends without kids or someone who wants the hold evening for dining. Waiter was awesome. The menu is very limited. Food was ok. But not excellent. Convenient for convention goers. We had an excellent time! We got there when the restaurant was busy, the service was prompt, we got sat immediately. 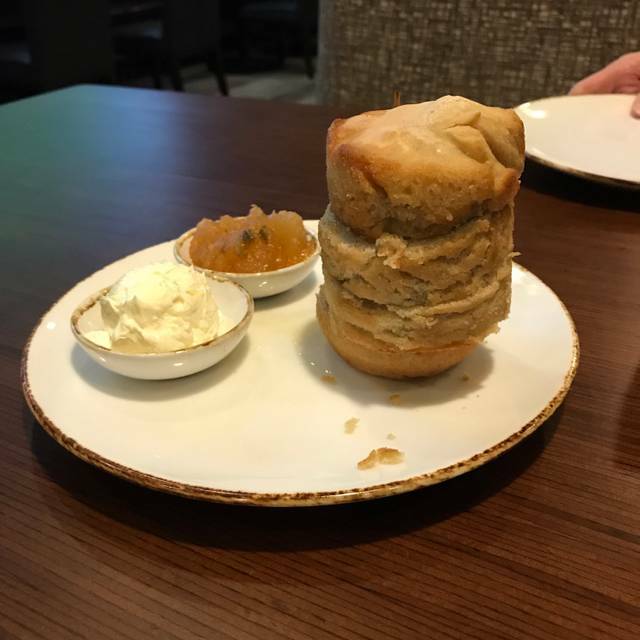 We have been trying to check Sthepan Plyes new restaurant and it didn't disappointed. I think there was a convention or something because there was a lot of people with similar clothes. We had a great time eating there, our food came on time, our server was very knowledgeable about the menu, drinks were amazing, great job on the new restaurant! We will come back very soon! Our server Seemed untrained and was not in the weeds just incapable. No one stepped up to help him. I blame the management for not acknowledging this nor coming over to apologize, etc. food was delicious. If we were forced to grat him the 18% bc we were a party of 6. $200 meal was a major disappointment. Overpriced for what you get. Food was good and atmosphere was fine. We enjoyed the atmosphere and the delicious food. The service was outstanding and the attention to detail was very nice. It’s a great place for a nice dinner but not too fancy or stuffy, just great food. The brussel sprouts were crispy with a wonderful taste, the chicken fried buffalo was wonderful and the smashed potato tots were unique and a great addition to the honey fried chicken. We will go back to try some of the other menu items. Upon hearing that this place had good food, we decided to try it for our Valentines date. It did not disappoint. The food was awesome! Had the most tender tenderloin. Ended the meal with a wonderful dessert called heaven and hell cake. It was amazing! We will be back here with friends! It was a really great place. I wanted to try everything. I loved that they did not rush me thru my experience. I had plenty of time between courses and we really had a nice time. Great variety on the menu--assorted price points too. The pork chop was the winner the night we ate, but we also enjoyed the tenderloin and sea bass. The fried chicken needed to be a little crispier, but had a good flavor. Will return! This restaurant is new to the area. We found it a delightful experience. The food was excellent and good value for the money. We will return and will recommend to our friends.